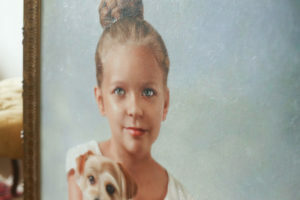 Have you dreamed of having oil painted portraiture of your children but had no idea where to get it? Or maybe you had to travel long distances to get what you wanted? Look no further than right here locally in Dothan, Alabama! Meet Dothan portrait painter and owner of Dear Violet Photography, Kim Thomas. I have slowly been refining my skills over the past couple of years to get to a level of where I wanted to offer this service to you. Here is a recent painting I did of my daughter London with her best friend, Max. 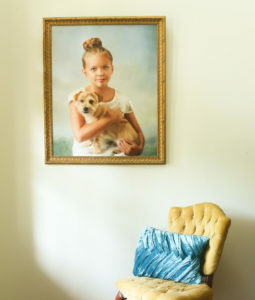 A staged example of how amazing your child’s portrait would look! It was professionally framed through a local Dothan framer who does amazing work! I feel like the frame was perfect for what I had in mind. It’s currently hanging in our foyer as seen below but will soon be moved to our dining room. I wanted to make sure and show you some of those gorgeous brush strokes. You come in for a consultation and we plan the photography session. This photography session is needed so that I can get plenty of images of your child that is a reflection of them and their personality. This includes the clothing they wear and maybe something else that is sentimental to them; from a book that they hold to a doll they love. Although nothing is required. I am collecting a closet of children’s vintage and vintage inspired clothing for your child to wear if you prefer. If you already have something in mind for your child to wear that’s fine too. 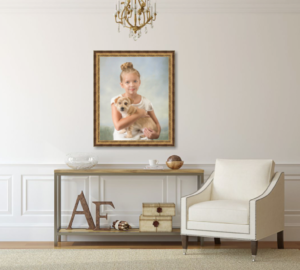 We also discuss where your portrait will hang in your home and what size it needs to be. This gives me an idea of how to photograph the session, in a horizontal or vertical format. Also consider what colors you’d like the background and what colors your child will wear if you’d like it to coordinate with the style and colors of your home. We have the photography session in my home studio which should take about one hour. After the session, we meet up and decide which image you’d like painted. At this point you will also have the option to purchase the other photographic images that have been taken. I start the painting process which usually takes about 4 weeks. It is skillfully digitally painted. After the digital image is printed onto the canvas size that we previously decided on, oil based brush strokes are carefully painted on. After this, I’ll let you know the image is complete. You have the option to do framing through me or I can give you references to framers in the area that I find reputable. The process as a whole takes about 2 months. The wait on this custom master piece is totally worth it for the beautiful piece of art you will have to hang in your home. It will be an heirloom that can be passed down for generation upon generation. If you’d like to book a pressure free, complimentary consultation to find out more about this and see this custom work in person, please don’t hesitate to contact me at 334-379-6560 or feel free to email me, Kim Thomas. I’d also love to meet you on my Facebook fan page!